The origin of the kolache is uncertain. One version goes like this: “A mother, busy with her weekly baking, broke off a few pieces of dough to keep her little daughter occupied. The little cook kneaded her dough into flat cakes. She selected several plums from a bowl on the table and placed the fruit into the center of the round piece of dough. Her cake went into the oven along with Mother's bread. My recipe is from my mother's mother, Mary, was of Czech heritage. When my mother was a young girl, she left school after the eighth grade (not uncommon in those days) to start working. Her first job was to do the weekly baking for a neighbor with a large family and a new baby. 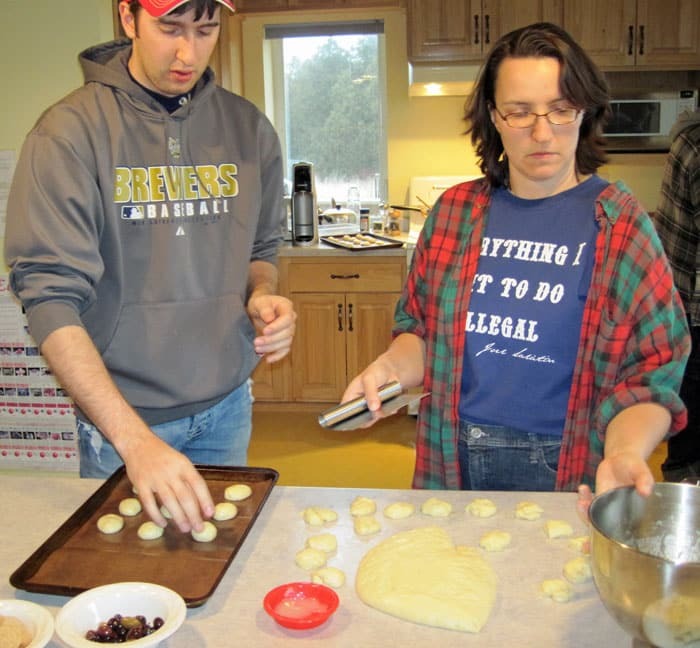 Back then, all the farm families did baking once a week, and that baking usually involved kolache, at least in the area around Haugen, Wisconsin where mom grew up. 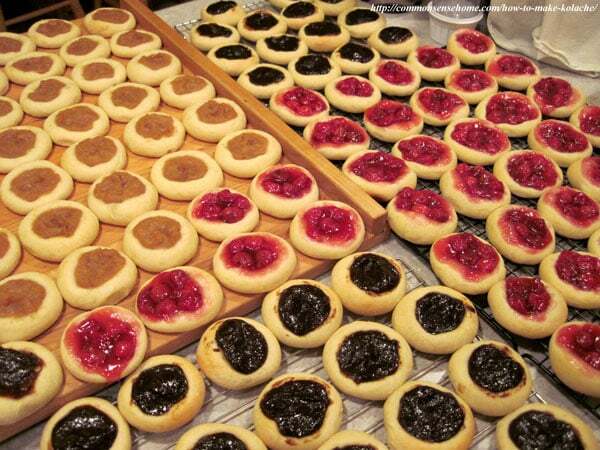 Since then, my mom probably baked several thousand kolache (and put the salt in most of the time). We always had kolache for the holidays, and fairly often during the rest of the year when there were more of us at home. (I'm the youngest of six kids.) We used to make them sometimes for the catering business, too. Now I generally only bake them for the holidays, as I have cut back on our sweets, but I still want to make sure this family tradition gets passed on to the next generation. 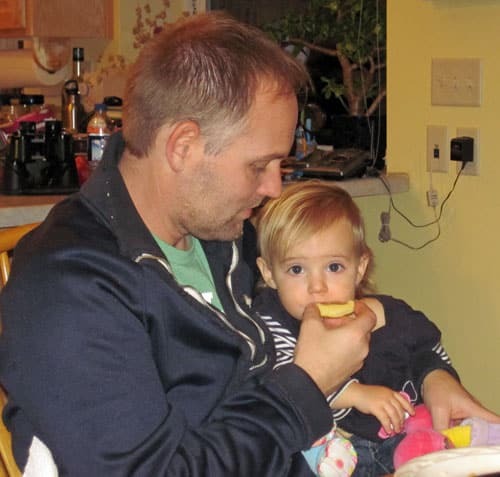 I was fortunate to have my niece and nephew visit with their spouses (and toddler) this weekend. We had a nice visit, and they pitched it to help make “kolache just like grandma used to make”. 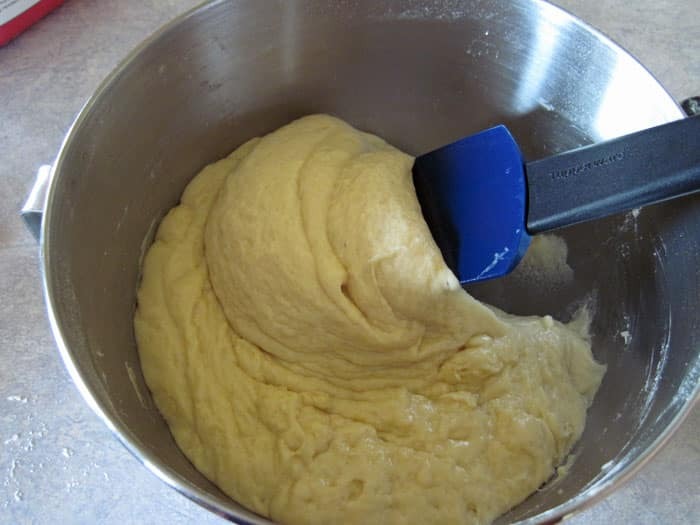 Using a large bowl (you can do this in a KitchenAid mixer or Bosch universal mixer with a dough hook, or by hand), dissolve yeast and milk. Add sugar and salt, let set until bubbles form (about 10 minutes). This is called “proofing” the yeast, and is required for the dry yeast but not for the instant yeast, although I often do it anyway with recipes like this. It helps to activate the yeast, warming it nicely so you get alight, fluffy dough. With wooden spoon add lard or poultry fat, eggs and 1 cup flour. Using lard or poultry fat (my mom preferred duck fat, when available) or other saturated fat will result in a more tender dough and better shelf life. Add rest of flour slowly, beating after each addition, to form a soft dough. Mom always used to scold me because I'd make the dough too stiff. You want it to be a bit sticky. Cover with towel. Let raise in a warm place until double in size. I often tuck mine on the back of the stove, or you can place it on top of the fridge, or even set it in a bowl of warm water. 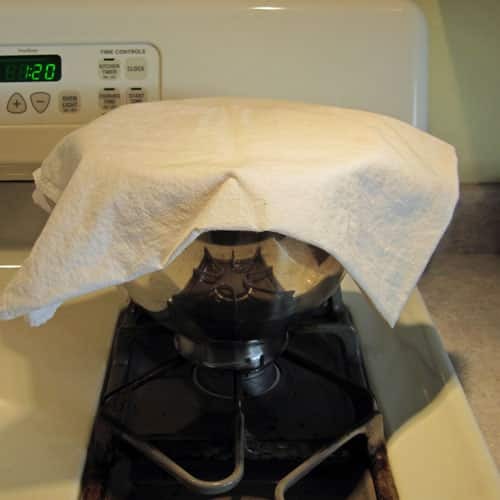 Just don't leave it alone too long on a warm day, like the one time we came home from church and found kolache dough all the top of the stove and oozing down the front of the stove. That was a real mess to clean up! Punch down dough and cut into golf ball sized pieces. Grease your hands before working with the dough, as it will be sticky. Palm roll the dough into balls. Here's a shot of my nephew and I rolling out the dough. I like to cut the mass of dough apart with my kitchen chopper/scraper. Place balls on well greased pan or pan lined with parchment paper or reusable parchment paper and brush balls with melted oil. Let raise until dough is light (double height). Preheat oven to 375°F. Press centers with fingers to form a depression, then fill depression with fruit fillings. Use pie fillings such as: blueberry, peach, apple, raspberry, prune, applesauce, poppy seed, lemon and apricot. You can use commercially prepared fillings, but most of the time I make my own. (See filling recipes below.) you want to fill them about level, not too full or they will run all over. 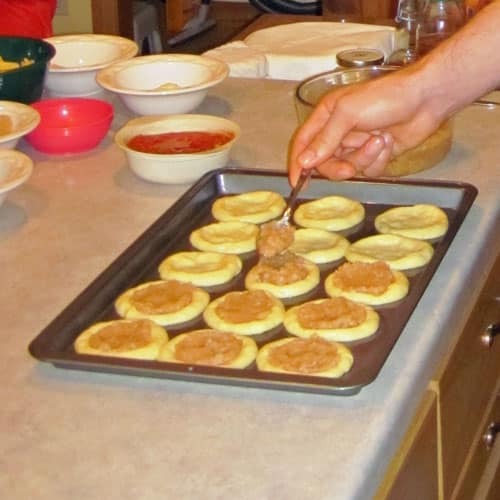 Close up of filling kolaches – see how the centers are pressed in? Bake at 375°F until light golden brown, about 10-12 minutes. Do not overbake! Remove from pan to cool on a wire rack. Makes around six dozen. In a small bowl, mix sugar, cornstarch and salt together. Combine all ingredients in top of double boiler, cook until thick stirring often. Cool until thick. If cooking in regular pan be careful not to scorch your fruit. Be sure to premix your sugar and cornstarch, or you're likely to get lumps. Prune, peach, or apricot filling: Cook 2 lbs of dried fruit in enough water to cover until tender. Drain and pit if necessary. Then blend in ½ cup sugar, 1 teaspoon vanilla and/or ¼ teaspoon cinnamon. Use 1/4 cup tapioca granules for every four cups of applesauce. Add cinnamon and sweetener to taste. This lightly sweetened, fruit filled pastry recipe has been handed down in my family for generations. Using a large bowl (you can do this in a KitchenAid mixer or Bosch universal mixer with a dough hook, or by hand), dissolve yeast and milk. Add sugar and salt, let set until bubbles form (about 10 minutes). With wooden spoon add lard or poultry fat, eggs and 1 cup flour. Add rest of flour slowly, beating after each addition, to form a soft dough. You want it to be a bit sticky. Cover with towel. Let raise in a warm place until double in size. Punch down dough and cut into golf ball sized pieces. Grease your hands before working with the dough, as it will be sticky. Palm roll the dough into balls. Store in a sealed container at room temperature. Best if eaten within a few days of baking. May be frozen for up to a month. Place wax paper between layers of kolache to keep them from sticking together. It looks like we have a new kolache fan in the family. I hope you enjoy this recipe, and I wish you many wonderful days of sharing holiday traditions with your loved ones. if you've enjoyed this post, please pass it along or leave a comment. 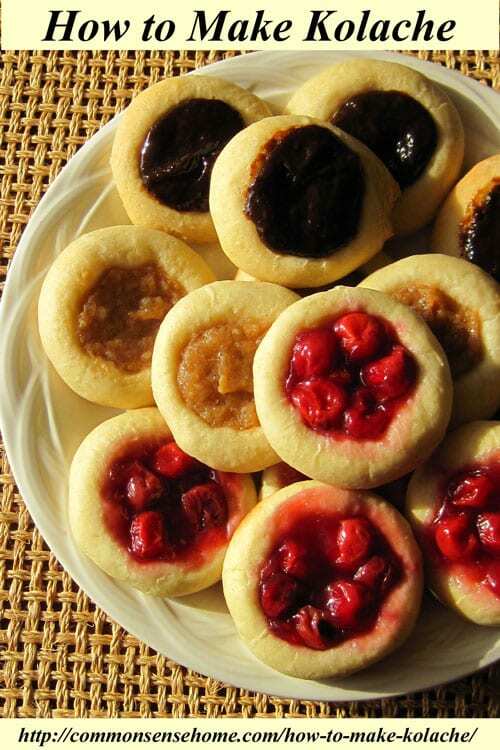 Share your holiday traditions – or your family's version of kolache. thanks for this, I love Kolaches and am happy to have a good recipe to work from. What does your shirt say in the picture? Sure, if that’s what you have on hand. I am of Moravian decent myself and have my grandmother's recipe. She learned to cook them in a my great grandmother's wooden stove. It takes a lot of room but I feel they are with me on the occasions when I make them. It feels good to be carring on a piece of history. Did you make the Hungarian Rolls too? Genevieve – I've never mastered wood stove cookery, but my mom cooked on a wood stove when she was growing up. Anonymous – yes, I made the Hungarian Rolls, and will hopefully have that recipe up today. Busy weekend! Thanks for sharing, Laurie! Our recipes are very similar, of course. The sweet dough is exactly the same; just different fillings. I made my kolache on Saturday, too. Did the "logs" with walnut paste, and then muffins with poppy seed filling. Yummy! 🙂 This year, though, I did "upgrade" the sweetener: in the dough, I used raw agave nectar, and in the walnut & poppy seed fillings I used organic evaporated cane juice. Anne- on your poppyseed filling, did you start with plain poppyseeds? Those can be hard to track down. My grandmother used to raise a small field of them to use for baking. Julie – my grandmothers both had aprons just like your grandmother's. 🙂 I suspect it had to do with laundry day coming only once a week with a ringer washer. I'm sorry, but it isn't a kolache unless it has poppyseed filling–:). Do you want my North Dakota Czech grandma's recipe (from early 1900's): 3 cups ground poppy seed; about 1/2 c. raisins, 1 c. sugar, 2 c. milk and 1/2 c. whipping cream. Cook that in a cast iron frying pan either in the oven or on the stove until almost dry, stirring occasionally. Put in in a bowl to cool. When it is cool, add 1 cup sugar, 1/2 tsp. anise and 1 tsp. cinnamon. Good source for poppy seeds is in bulk spice part of a store. It's best to grind them in your grandparents' poppy seed grinder (another smile, but you can still buy poppy seed grinders if you are inclined), but if you don't have that you can use any grinder-type device, including a good blender. This makes a lot of filling and what you don't use can be frozen. Making the filling is work on its own, and I often still follow my grandma's strategy of making the filling one day and kolaches the next. Our kolaches are always closed. Family lore was that the open-faced kolache were German in origin, not Czech. Believe it or not, I do have a poppyseed grinder. I found it at an estate sale a couple of years ago. I've grown poppy plants in my garden, too, although not as many as my grandmother. She used to have an entire small field to produce their poppy seeds for the year. Mom would freeze her kolache fillings, too, but she used to bake a lot more than I do. With just a single batch of dough, it's not much to make filling and bake in the same day. At the local Czech fest in our area, all the kolaches look similar to the ones shown above. The variations around the country are interesting. 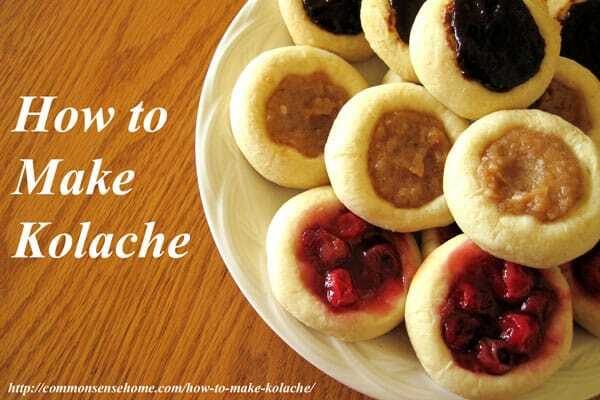 We just love Kolache, and your tutorial is excellent. I would love to have one or two right now they look so good. I will be giving your recipe a try very soon. Thank you so much for sharing with Full Plate Thursday. I want to wish you and your family a very Merry Christmas! Hmmm. I have never made Kolache this way. I have always made the long rolls that my Czech Baba taught me. My favorite is the nut filling. In Youngstown, Ohio, where there are still lots of Czechs you can find big 5# cans of poppy seed filling. I don’t like the poppy seed filling. But I do like the apricot. We always would spend the entire day making kolache for the holidays. I’ve never seen the long rolls, although I have seen folded squares. I think there are many ways of making them (maybe more) as there are ways to spell the name. What a lovely tradition. My family doesn’t really have anything like that but my husband’s family is from a very German town and they all make springerle during the holidays. Would these be just as good,using Tallow ? They look delish…………………. I find the taste of tallow to be a little strong for my palate when used in sweet baked goods (I prefer to use it for savory dishes), but if you are used to it and like it, it may be okay. I was wondering can you freeze these cookies. You can freeze these pastries in layers with wax paper or parchment paper between. The quality will not be quite as good as fresh, but acceptable. I was hoping to see your Hungarian rolls, as my grandparents were Hungarian and I wanted to see if they are the same, but the link is not working. We always made kolache with a prune or raspberry filling, and scored the dough into squares, then after filling, just pulled over 2 opposite corners and of course sprinkled with powdered sugar after they baked. I need to be making these again, and teaching my daughter and granddaughter! I moved the website from blogspot to its current location back in 2012, and there are still a couple links here and there that point back to the old site, which is now gone. If you run into a link that’s not working, you can use the search box at the top right of the website to find the current link. My Czech step-grandmother used to make these with poppyseed filling but hers were enclosed. They were delicious! I’m glad to have the recipe since hers disappeared when she passed away (I’m sure one of my step-sisters has it but won’t share it). PLEASE tell me that the calorie counts and fat and carb counts are for the ENTIRE recipe. I don’t calculate the calorie counts or carbs, etc. That’s estimated by the recipe widget. Because I didn’t put in the number of servings, I’m assuming it just calculated the entire recipe. That said, if you’re limiting calories or carbs, this recipe is probably not a best choice for you. More on the freezing/unthawing process… Do I bake them then freeze them? If so, how do I reheat them? If I freeze them unbaked, do I unthaw them first? Thanks! PS-I want to make a full batch, but our household consists of 2 people, and would like a way to store them for future days ahead. Would like to do a Huevos Rancheros Kolache texan style closed. Thanks again! I bake them before freezing. The finished kolaches are placed in a container with wax paper between the layers of pastries (if you do more than one layer). To use, simply remove from freezer and thaw to room temp. You could freeze in multiple small containers, or even slip a piece of cardboard under a piece of wax paper and put 4 kolache into a ziplock bag with the cardboard to stabilize them. what if I want to par bake these to finish baking the next day? if Im giving them as a gift and I dont want them fully cooked when I give them away–so they can finish the baking at their home and have them fresh out of the oven-soft-and not over done from a second baking. I wouldn’t recommend it. These aren’t loaded with preservatives like store par-baked goods. If you use lard or poultry fat – even butter – they should still be soft and tender the day after baking. You’re welcome, Veronika. Glad you liked the recipe. I like your recipe but mine seem to “puff up” too much while baking, any suggestions? Are you making the centers really flat before adding filling? I often go through and flatten them all down initially, and then flatten them a little bit more as I fill. Can I use bought biscuits for the dough? You could smash biscuits and fill them with fruit, but they wouldn’t taste like proper kolache. Laurie, can you double or triple this recipe? Sure, as long as your mixing bowl is big enough. My Mother in law is Czech. Her mother made Kolache from memory once a year at Christmas, using prune filling. 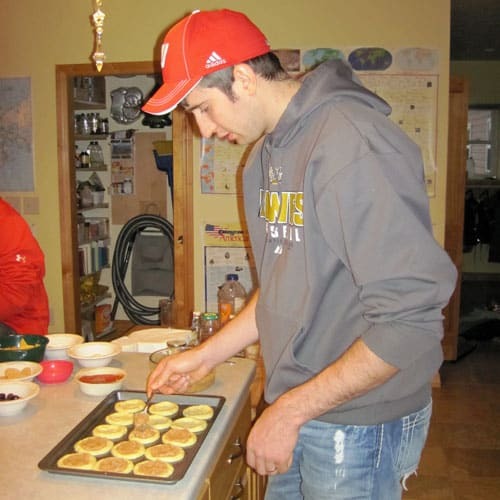 She didn’t teach that recipe, but did pass on Ruliks, which everyone loves. My MIL will be 90 this summer, and I wanted a recipe like her mother’s to make for the celebration. Thankyou so much for sharing! Your koláče look lovely. My friend from the US tried this recipe, after I told him about the existence of koláče, and really liked it! I’m from Czech Republic and it’s really nice to see people from far away enjoying things that I’m so familiar with. Only thing that I have to point out (I’m sorry, but it would bother me not to). We never put whole fruit in koláče, it’s just so weird to see it. It’s always kind of paste. Not saying you can’t do it or that it tastes bad. It’s just not koláče.